Here’s a photo of the daily chaos we’re a part of each morning in front of the International Home Furnishings Mart building in High Point, NC. I just thought you should see the action! Rugs, rugs, everywhere! 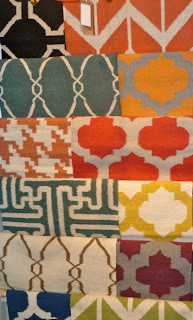 The two most important categories at this show are the Ikat patterns (Ikat is a dyeing technique used to pattern textiles that employs a resist dyeing process similar to tie-dye), and Flat Weave rugs (flat weaves are typically wool and made on a loom, and includes Soumak, Kilim, and Duhrie styles). The Ikat’s (shown above) were mostly in bright colors with elaborate tribal or ethnic patterns generally over scaled in size. The flat weaves were sometimes in brights but we prefered the more muted tones with simple geometric and striped patterns. The most shown pattern was a chevron pattern. Both categories were dominant in the marketplace. Purple Reign? Yes purple reigns and all shades of it soft (cool) and hard (warm), and reigned supreme yes it did. A color board for the color purple, below. Sunflower Yellowwas a close second, virtually tied with soft greys. The same colors were present in soft goods (throw pillows, throws, top of bed linens, hassocks), tabletop accessories, and furniture. A color board for the color Butrer Yellow, below. I mentioned hassocks, which Wikipedia defines as, “a piece of furniture used as a footstool or low seat, distinguished from a stool by being completely covered in cloth so that no legs are visible”. And hassocks were aplenty throughout the marketplace. We saw them in every conceivable cover and style. We saw them detailed with oversized whip-stitched details, covered in cowhides and rugs, and even in knitted covers, knitted with oversized yarns. And speaking of oversized yarns, several rug vendors showed very large scaled yarns in large patterns, making for unusually large textured rugs, shown below. Cabana Home buyers were invited by some of the larger rug manufacturers/wholesalers to review their lines (to hear their spiels), including SURYA and LOLOI. 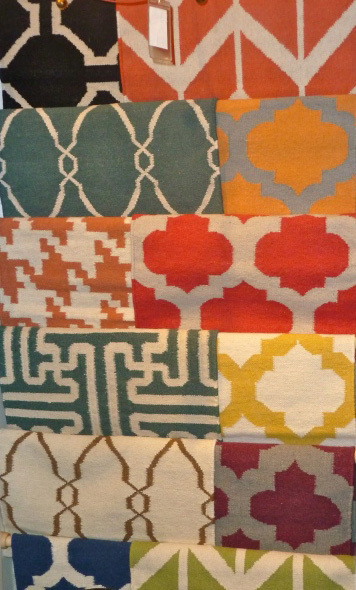 A sales representative of SURYA stated that they sell $80 million a year in rugs at wholesale, and maintain a stock of rugs valued at $30 million. That’s one heck of a lot of rugs! The showroom window of the SURYA Rug showroom, below. Switching gears, we had some fun at the Genesee River Trading Company, who specialized in antique and vintage camp decorative crafts and rugs. The owner, a colorful and charming hostess bedecked in all things turquoise, shared her vast knowledge and specialty in “Old Order Amish” furniture and crafts. She had more than one full size canoe in her booth, including a museum quality, full size spilt-bark canoe with decorative carved detailing and old tar covered seams. There was also a fully restored 1940’s Old Town Canoe from Maine built on a traditional cedar form with cane seats, hanging above the entrance to her booth. Lighting trends included lath turned wood, metal and blown glass. COUTURE lighting, a newcomer at the High Point Show, offered highly polished wood that resembled porcelain, in fresh shapes, topped with very interesting “double tiered” shades. Another company specialized in hugely over scaled lamp bases in a copper patina finish, and burlap shade. We loved a pair of brass “dog” lamps, a cross between Jonathan Adler’s ceramic dogs and the “Balloon Dogs” of artist Jeff Koons. See all of these table lamps and more at Cabana Home stores starting at the end of October. The Mexico based company Pol Art, offered up Grandfather Clocks and bookcases in the shape of classic furniture pieces, whereby the voids appear to be the solid and the solids appear to be the void. Seating was as interesting today as yesterday. A woven cane chair was made interesting with spilt bamboo trim on its base. Another chair with a “stripped” finish made from reclaimed teak was in the mid-century style. A noteworthy bench at Lexington was a shapely pair clad in leather with nail-head detailing and contoured reclaimed wood seats, pictured below. The highlight of this show for me was our meeting with the famed furniture building family of Alfonso Marina. This Mexico City based company is considered by many of the most important professional interior designers to be the crafters of the world’s best made furniture. After touring their High Point Showroom, I absolutely agree. Above: My favorite piece was the smallest piece we purchased, a highly detailed table top chest detailed in bone, tortoise shell and carved ebonized wood. We first worked with the furniture, not the firm, through their former United States distributor based in Los Angeles. A distributor is a layer between the manufacturer and the retailer, and the opportunity to intimately know the furniture maker can be blurred. Now there is no longer a distributor between the company and the retailer, and we are thrilled to be working directly with the Alfonso Marina Company. We were greeted warmly soon after our arrival by Carlos Marina of the renowned family of ebanista’s (Spanish for cabinet makers). He was lovely in his enthusiasm in presenting his family’s furniture, explaining how it’s made, how the inlay pieces are cut and applied, even how the hardware is poured and blacksmithed. The pieces are so authentically designed and finished. What appear to be centuries old patinas are made in their factories by skilled craftsman who have handed down their trade skills from one generation to the next. The furniture line is expensive, but now that we are able to work directly with the manufacturer, we expect to be able to offer our customers Alfonso Marina furniture for as much as 60% less than we were able to offer it to them a few years ago. We are excited to have Alfonso Marina back at Cabana Home. Cabana Home stores sell a lot of small tables and our team of Buyers was not disappointed in what we found here. We bought this set of Gold leaf-finished Nesting Tables with coral shagreen inlay top, picutred below. A Klismos style round table with marble top and steel base, pictured below. Worst in Show:Wasn’t going to do this today, but couldn’t resist! The Life Chest booth, a company who manufacturers the box to house your personal remains after cremation, and the memento’s from your life. 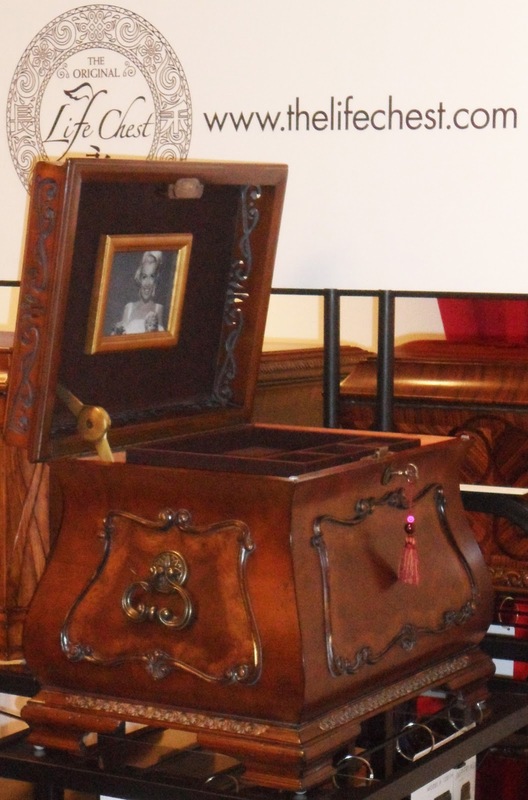 The elaborate wooden box shown was open and featured a photographed of Marilyn Monroe in the attached photo frame, the same place your pic will be if someone buys this treasure chest for you. Creepy!! All for today. 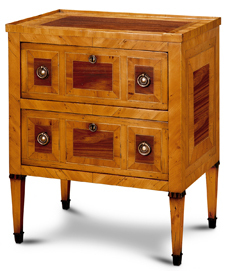 Join me tomorrow for the fourth day of the High Point Furniture Market.